The District of Columbia government is the first in the United States to charge customers five cents for disposable bags in order to clean up the Anacostia River. Customers, who do not bring their own bags, will be charged five cents per bag they need to pack their groceries, beverages, take-out food from street vendors and outdoor restaurants and drug stores. Exceptions include bags needed for bulk food items; frozen foods; baked goods; prescription drugs; newspapers; small hardware items; take home food or beverages from an indoor seating restaurant; and, dry cleaning. The Anacostia River Fund (ARF), which will manage resources from the new initiative, is tasked with cleaning up river pollutants, which include trash, oil, grease and chemicals. The ARF will engage a public education campaign to educate and inform the public on good practices to develop a safe river for fish to thrive and human to be able to swim in the river. Efforts will be increased to control sewer overflow; reduce storm water by planting trees and plants along roadways and parks; land erosion control; and, require polluters – including the Federal and District governments – for cleanup of toxic sites. 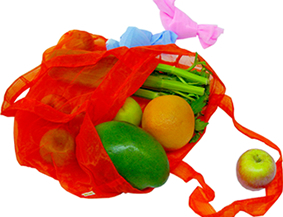 The first step is removing extra plastic bags from the environment. Several businesses are selling bags, which fit in purses, gym bags, shoulder bags in lite, durable, colorful fabrics for impromptu or weekly purchases. By customers using their own bag, they are supporting the first step in reaching the District of Columbia’s long term goal to have fish safe enough to eat in 22 years. Just as important, hopefully, long before 2032 – all citizens of the District of Columbia will have the FULL right to vote in the U.S. Congress (two Senators in the Senate and one Representative in the House of Representatives) to join the Anacostia River fish fry. Bags … just the beginning of change for the District of Columbia. Tags: 5 cents, Anacostia River Fund, Bags. Bookmark the permalink.